The price of BTC has risen to new heights and this could probably go for a solid year or more. With that being said, people, of course, would hear about this BTC “thing” and start buying their own share of this coveted cryptocurrency. The hype would multiply the value of the coin more than a thousandfold and this naturally directs people into channels that dispense Bitcoin or any cryptocurrency they want. Today, we will be looking into one of the websites that act as a BTC exchange and trading platform at the same time. We are talking about Bitbay.net. We will look into what they have for us, what their background is, their features, how to deposit and all that fun stuff! Without further delay, let’s talk about that! The website was established in 2014 and has grown to be one of the largest exchange websites in Europe today. Based in Poland and a new office in Amsterdam, the company is spearheaded by their CEO Sylwester Suszek –who is well-versed in the finance world. Bitbay.net is also active when it comes to charity events, conferences, and education to raise awareness on how huge the crypto-world is today and how people can take advantage of it. Now that we’ve talked about their background, let’s create an account with them. 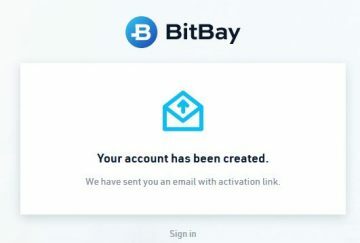 To create an account, head over to their website Bitbay.net and click on the Register tab located on the upper most part of the homepage. Once you have clicked on the register tab, a separate tab will be provided with an option to choose which method you want to go with, but there’s only actually one choice and that is to provide an active email. At this point, we figured that the website doesn’t have any problems creating an account anonymously. Once an email has been provided, you will be prompt that they have sent an email confirmation to the given address. The confirmation is fairly fast and should arrive at your mail within seconds of clicking it. Surprisingly, the registration isn’t done yet. After clicking on the confirmation email, you will be redirected back to their website with fields that you need to provide. This includes your login, password, and a personal PIN, country of origin and preferred currency. To go beyond an unconfirmed account, you just need to log into your account and have it verified once all the requirements are submitted. Requirements will include address confirmation, identity confirmation, proof of address file, and ID file to be uploaded to the website for verification purposes. One of the awesome features that they have would be their BitBay card (MasterCard) in which owners of the card are able to withdraw cash from local ATM’s in Poland and abroad. With 10,000 PLD withdrawal limit per day, you will automatically have an outlet to withdraw money from your exchange account. To read more about this awesome feature, please click here. Now we’ve come to the most interesting part of the review, which is their trading platform. 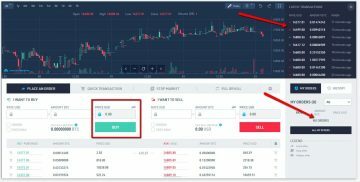 Our first impression is that the website’s trading platform is properly designed and pretty much looks like the usual exchange websites today since the main tabs are located on the left-hand side of the platform. Not shown in the screenshot, but on the upper left-hand side of the candle chart, the market and currencies can be seen. Here, traders are able to see the pairs against USD, PLN, EUR, and BTC. To name the pairs under USD, we’ve got BTC, ETH, LSK, GAME, BCC, BTG, LTC, and DASH. For PLN, EUR, and BTC, we’ve got the same pairs listed. Shown in the screenshot, to purchase or sell you just need to provide the amount you want to purchase and the platform will automatically provide you with how much BTC you will receive after their conversion rate is processed. The latest transactions can be seen on the right-hand side of the platform with the rate it was a purchase, the amount of BTC of the transaction and when the transaction took place. Below that is where all your orders will be listed once they have gone through. It would have been better to have a test account but it seems that their website doesn’t have this feature. Their exchange platform is really informative and easy to use without any problems in regards to the website’s response ability since there was no delay experienced when we went through it. For people that just simply want to purchase BTC from the website, all you need to do is click the “Wallets” tab found on the main panel located on the left-hand side of the account page. Here users are able to purchase different currencies depending on the available listed currency. This would, of course, include the mentioned currencies earlier in the review. Generally, their fees here at Bitbay.net would depend on the monthly volume trade size. The taker fee for the website ranges from 0.25 to 0.43% and the maker fee runs around 0.17 up to 0.30% per transaction. You can read more about the complete list of fee schedules here. The website accepts BTC or their available cryptocurrency deposits. What’s even better is that they also accept Fiat deposits for their Fiat currencies namely USD, PLN, and EUR. Options include Wire Transfer for USD and EUR. For PLN, we’ve got Poczta Polska and Zabka and of course, Wire Transfer. There are no charges for cryptocurrency deposits and USD/EUR wire transfers this also includes PLN wire transfers. The only charge for deposits would be for the other options for Polish deposit options and is 2% of the deposit value plus store charge for Zabka. Overall, Bitbay.net is great since they have the ability to turn your online crypto into real spending money with the use of their physical card. They also have flexible deposit options to choose from which is always great when it comes to exchanging websites. We had fun going to their website especially their trading platform since it’s really easy to use. The only thing that we think that they should work on more would be the available coins they have. Please do let us know what you think about the website in the comments section below.